Chinese refusals are rooted in maintaining miánzi and lián, which are oriented toward a person's public image. Refusals are realized through reciprocal avoidance of face-to-face confrontation. In Chinese, it is necessary to preserve the interlocutor's face and to leave a way out for the refuser him/herself. Since a fundamental principle for social interaction is that it be based on reciprocity, a speaker's own miánzi cannot be preserved unless the other person's miánzi is maintained as well. The honor of being invited or given an offer should be acknowledged and the miánzi of the person being refused should be maintained. At the same time, the refusal must be effective and clear in meaning but not rude. Chinese speakers express their intention not to comply with the interlocutor's proposed action plan, indicating "no" in a polite way. This type of negative response is sometimes referred to as "substantive refusal". However, in Chinese, speakers are generally not supposed to accept an invitation or an offer right away. They should normally refuse several times before accepting. Such refusals are termed as "ritual refusals" and are almost obligatory in Chinese. Repetition of part of a request, etc. Giving a reason is the most frequently employed refusal strategy in Chinese and occurs about a third of the time. The reasons normally stress prior commitments or obligations beyond the speaker's control to imply that the refusal is not the speaker's deliberate preference for non-compliance. This prevents miánzi of either side from being hurt or lost. Giving a reason is probably the most commonly used refusal strategy in response to requests, suggestions, and invitations. However, in response to offers, giving a reason is not the most commonly used strategy. Refusing an offer actually minimizes the offerer's costs and is least likely to hurt the offerer's miánzi. Therefore, reasons are probably not required as much as in refusing requests, suggestions, and invitations. Giving an alternative is the second most frequently employed refusal strategy that provides a way to avoid a direct confrontation. Giving an alternative also acknowledges the interlocutor's miánzi by showing the refuser's concern for the interlocutor's needs, and softens the threatening power of refusals. Direct Refusal is the most explicit, and thus a very effective refusal strategy that is appropriate only in limited occasions. Regret, as the formula I am sorry, projects a refusal and indicates strong non-compliance. An expression of regret is sometimes used in combination with other strategies. It typically appears in the final position in the sequence of a refusal. The use of the formula I'm sorry does not necessarily indicate sincere regret. Rather, it means that the refuser cannot control the situation and signals "no more negotiation." Sincere regret would require making a statement of an alternative as Chinese parents admonish children to do so to express sincere regret. In Dissuading the Interlocutor, the refuser expresses consideration of the miánzi of the person being refused and reminds him/her of the refuser's own miánzi. This strategy shifts the focus of the refusing act from the refuser to the person being refused, this strategy is preferred when refusals may hurt the other's miánzi. Since avoiding a direct positive response indicates refusal, Avoidance can be interpreted as impolite. It is one of the least frequently used refusal strategies. Postponement is a preferred substrategy of Avoidance. Acceptance that Functions as Refusal is rarely used. 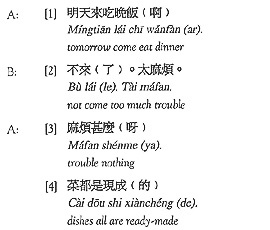 Stating Principle and Folk Wisdom is rarely used in Chinese refusals, although its absence in American English can make the use of this strategy seem more salient than it really is. Refusal strategies often occur in combination. 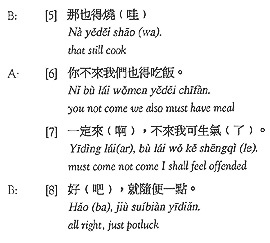 The most frequently used sequence for Chinese refusals is Reason-Alternative. Giving a reason focuses on the refuser's negative response to the interlocutor' initial idea, attempting to minimize the disruptive impact of the refusal by explaining why compliance is not possible. Giving an alternative is hearer-related, focusing on the needs and goals of the person being refused by presenting an alternative action plan that might be an agreeable option. While Giving a reason is speaker-oriented, Giving an Alternative is hearer-related. Ritual refusal is so closely tied to Chinese cultural values and discourse conventions that it can lead to cross-cultural miscommunication. 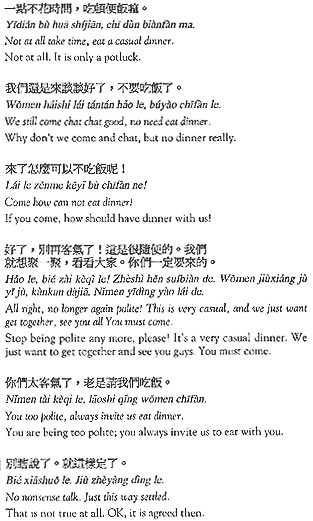 In Chinese culture, an invitation to dinner often functions as a leave-taking act and the speaker's expression of good wishes. A host might say "Please stay for dinner/lunch," and then, the guest typically declines the invitation and takes his/her leave. The invitation is often, if not always, a ritual one which is often inappropriate for the visitor to immediately accept. It is a strategy to have the visitor leave the house, or a conventionalized way of saying good-bye. The host not only gives miánzi to the visitor by showing that the visitor is a welcome guest, but also enhances the host's own miánzi by offering hospitality. The ritual refusal is a polite refusal strategy to indicate the refuser's consideration of the interlocutor. Ritual refusal helps us gauge the real intentions of the inviter/offerer to determine the sincerity of the invitation/offer. For a ritual invitation, to decline is the only appropriate response. If the assessment shows that the inviter/offerer is sincere and serious, ritual refusal is likely to lead to acceptance. To decline a ritual invitation, it is appropriate to give light self-oriented excuses or take up the host's inviter's future invitation. 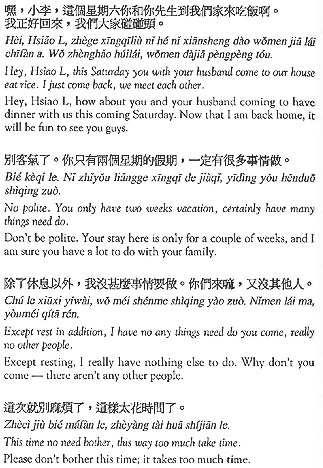 Below are some literally translated example sequences of invitation-refusal. The invitation-refusal sequence is played out three times in each example before acceptance.